It’s time for Friday Favorites!! These are a few of my favorite things.. this week! If you’re looking for an October that will keep you on the edge of your seat (or couch😉), try The Ice Twins by S.K. Tremayne!! I’ve had this pair of Madden Girl Chelsea Boots in brown since 2015. I’ve used and abused these babies and they still look great!! 😍 These are by far my favorite booties! So classic!! C.S. Lewis Mug.. Can you say Precious?! I used this sweet C.S. Lewis mug by By Humor and Grace on Monday and it set the tone of my entire week. ☺️ If you can get Monday off to a good start, then your week will be just fine. 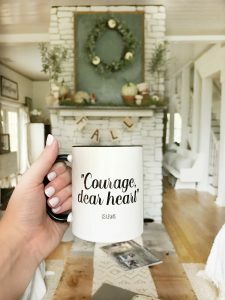 This sweet mug is so encouraging!